Follow the latest SJSU news at today.sjsu.edu. I think you do a great job regarding Washington Square. I truly enjoy the articles. It’s still hard for me to believe it’s been so long since I was there. Always couldn’t wait to graduate. Now I know how great those days really were: 1972 was an interesting year in that we became California State University, San José (for two years) and then SJSU. Grads from ’72 and ’73 have diplomas like that. 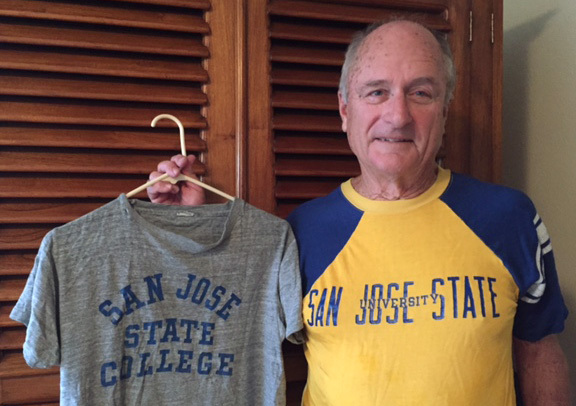 I still have a San José State College and the first San José State University T-shirt (as much as my wife would like me to toss them). Aloha! I’m honored to be included in San José State University’s “Power Portraits” exhibit in its recently redesigned Student Union. 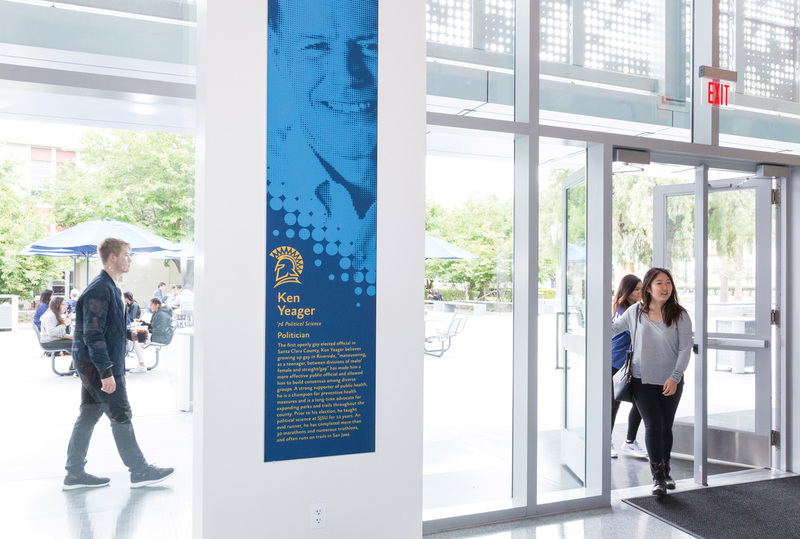 My story, along with those of several other distinguished alumni, was selected as one that embodies “grit, smarts and hard work” that comprises the story of SJSU. I owe a great deal to the education I received at SJSU, and over the years I’ve been fortunate to stay involved with the university. I hope my story and the many stories of SJSU can inspire current and future students to enter the world with the confidence to live authentically and create meaningful change. Awesome read! Way to go Mary Poffenroth! I am a middle school teacher because of Professor Cynthia Rostankowski. Her passion for education, higher learning, critical thinking and the pursuit of the “ah-ha” moment makes her a facilitator unmatched in the field of education. 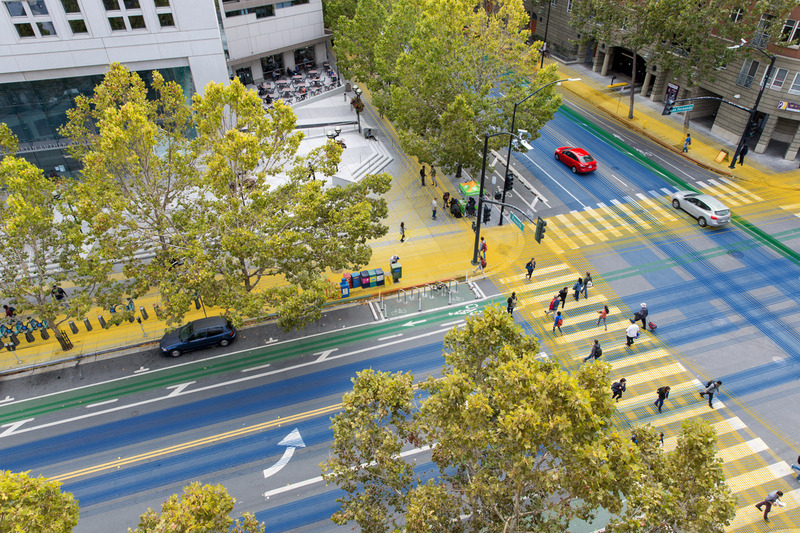 San José State University is brightened by her efforts and achievements. When we posted our Fall/Winter 2015 story “The Cross Section of Collaboration” on Facebook, Spartans responded with comments about real and perceived boundaries between campus and downtown. Read more comments on Facebook. I would like more information on what “boundaries” means. I’d personally like to be less connected with downtown because we get transients wandering campus, rooting around in our trash cans, and soliciting students. Sometimes this makes me feel unsafe. Especially because there have been a lot of campus shootings, I don’t think this is the time to be letting the outside in more. It’s interesting that 18 years ago the gateways at each entrance of the campus were built to create a tangible boundary where the campus began. If Fourth Street could be underground, the above ground street could be turned into a grass and walkway transitional point. Underground parking garages on Fourth and Seventh would take away ugly concrete barriers. There are many opportunities for the university to partner with the city of San José to make our community a better place. Pachanga on the Paseo (above), part of SJSU’s annual Legacy of Poetry celebration, was held at the Hammer Theatre Center, now operated by SJSU in partnership with the city.